Boardwalk has an exciting and expanded foodservice assortment available with nearly 100 new SKUs. We now have the critical staples that restaurants, To-Go shops, cafeterias and convenience stores need, all at a great value. 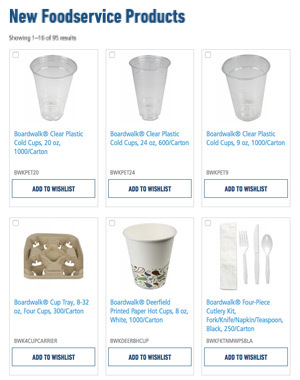 From a comprehensive assortment of PET cups and lids, to cup sleeves and multi-cup carriers, along with cutlery kits and hi-impact plastic dinnerware, this new assortment presents a great new opportunity to stock up and save with Boardwalk. Click here to see the full assortment. 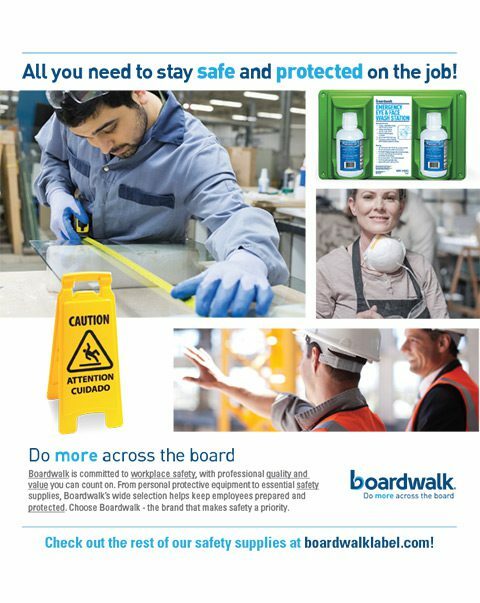 Boardwalk now offers a robust portfolio of safety products from personal protective clothing and equipment to essential safety supplies. We now have hand, eye, hearing, respiratory protection, coveralls and more. Plus, it is even easier for you to sell safety category with a new, editable selling tool. Just download the PDF file and insert your logo and contact information on the front and populate your pricing on the back. Choose Boardwalk and make selling safety a priority. Tired of over-ordering supplies for your office space? 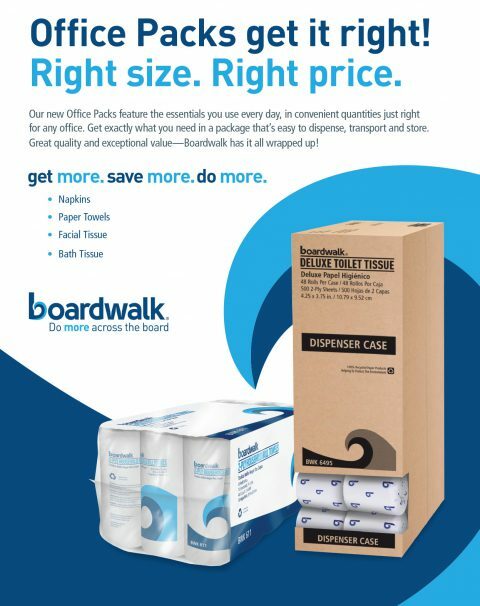 Introducing NEW Boardwalk Office Packs, perfectly packaged sets with workplace essentials in convenient quantities that won’t break the bank. Get precisely what you need in a package that’s easy to dispense, transport and store. Our Office Packs come pre-loaded with supplies such as napkins, paper towels, facial tissue and bath tissue. Superior quality and exceptional value – That’s the Boardwalk way to do it! See our sell sheet today for more about our products. 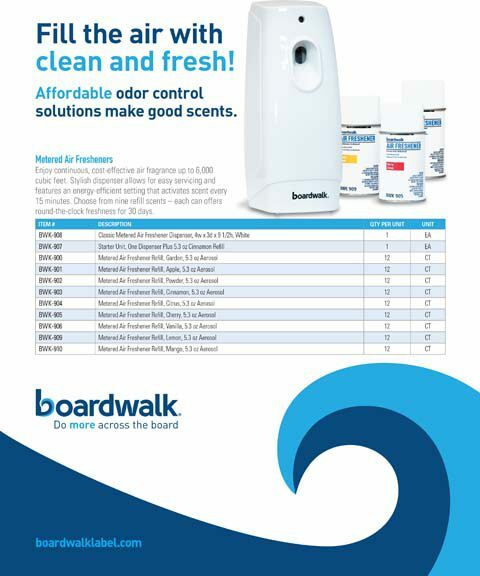 Boardwalk’s new line-up of air fresheners and odor control products make it easy and affordable to freshen the air – where it’s needed, when it’s needed. Our stylish dispensers spray every 15 minutes to keep scents circulating for up to 30 days. Best of all, Boardwalk’s fragrances reach up to 6,000 cubic feet. Available in 9 inviting fragrances and competitively priced, our air fresheners and fragrance dispensers keep odors tucked away and under control. Other odor-busting products include toilet bowl clips, urinal screens and commode and urinal mats. Download our customizable sell sheet for product information and item numbers. Boardwalk Hotel Guest Amenities: Tiny packages. Huge benefits. 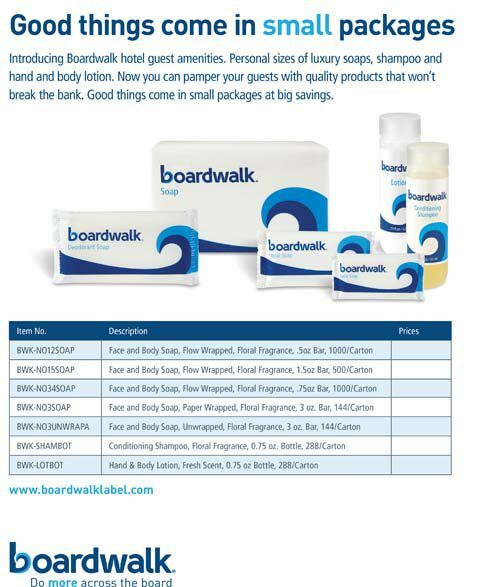 Small package, big results: Boardwalk’s high-performing hotel guest amenities including soaps, shampoo and hand and body lotion are available in personal sizes. Perfect for hotels, hospitals, casinos, airports and convenience stores, Boardwalk’s hotel guest amenities are convenient, affordable and performance-packed. Our face and body soaps and shampoo are available in an inviting floral fragrance with lotion available in a fresh scent. Click here for our customizable sell sheet with all available items! Whoever said basics have to be boring? 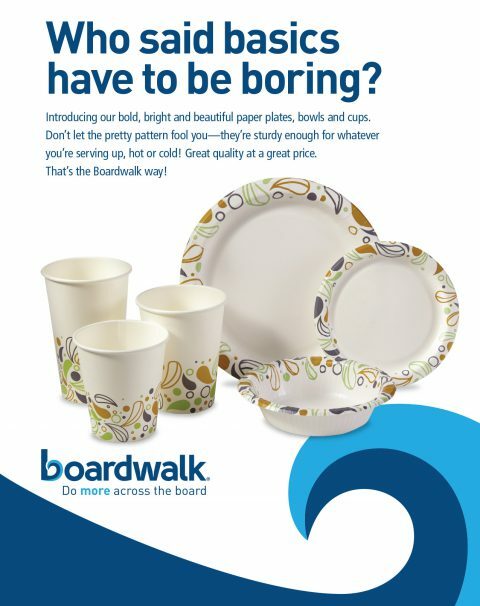 Introducing Boardwalk’s bold and bright disposable dishware selections, guaranteed to spice up every cafeteria and break room. Don’t let their pretty Deerfield pattern fool you – they’re sturdy enough to stand up to even the toughest, heaviest and meatiest meals around. Our packages include plates, bowls and hot & cold cups. Great quality meets greet prices. It’s how Boardwalk helps your business get things done! See our sell sheet today for updated item numbers and exclusive package offers. Our economical and specially formulated concentrates perform key tasks and work together as a total solution for professional sparkling shine every time. See our sell sheet today for item numbers and product details. Boardwalk Hand Sanitizer: Goodbye Germs, Hello Savings! A healthy staff means a healthy bottom line. 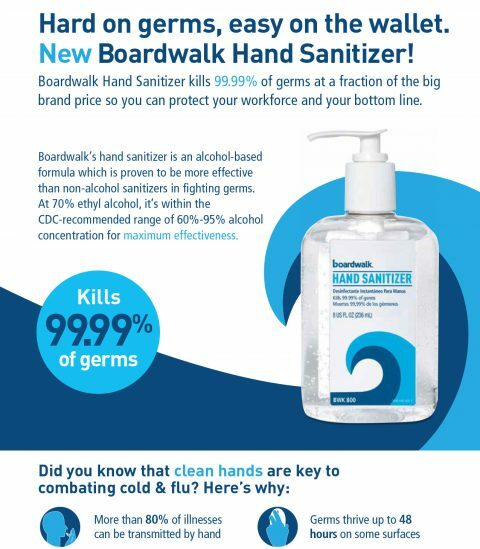 Keep your workforce safe and combat the cold & flu with NEW budget-friendly Boardwalk Hand Sanitizer! Our alcohol-based formula kills 99.9% of germs and is proven to be more effective than non-alcoholic sanitizers at fighting bacteria. At 70% ethyl alcohol, it’s within the CDC recommended range of 60%-95% alcohol concentration for maximum effectiveness. Best of all, it’s easy on your company’s wallet too. Invest in the safety and protection of your workforce today with effective and cost-friendly Hand Sanitizer from Boardwalk. See our sell sheet today for more exclusive details. Ready to rethink the way you clean? 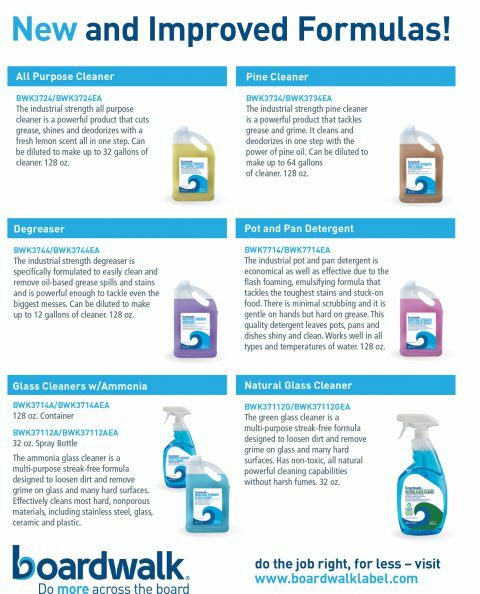 Our new and improved concentrated chemical formulas give you the freedom you need to carry out even the toughest cleaning jobs. Available in 128 oz. pour bottles or 32 oz. spray bottles, our products provide the flexibility you need to clean areas big and small. 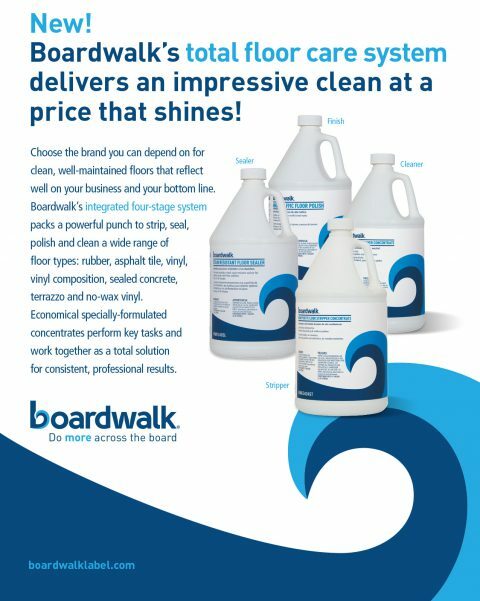 With our competitive pricing and dedication to your business, it’s easy to see why so many choose Boardwalk. See our sell sheet for product specifics and item numbers today!